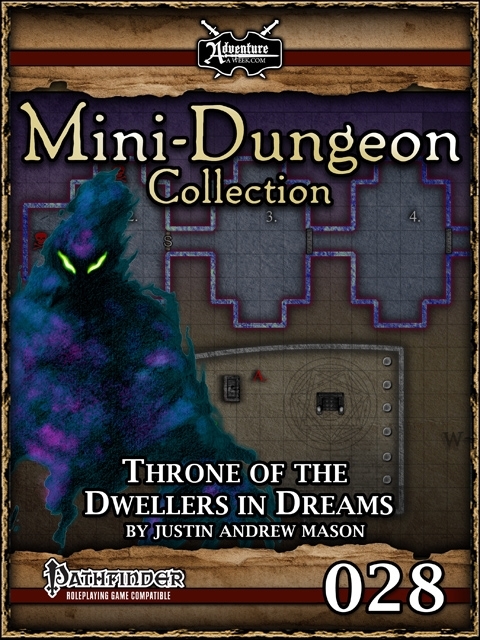 Another Mini-Dungeon I wrote is now available for purchase. 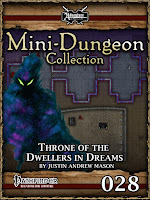 Throne of the Dwellers in Dreams is an adventure for six characters of levels 5-6. While seeking work the PCs are contacted by an artificer named Vynthis Targain who offers them a job investigating an ancient tomb complex. He is convinced the site contains information pertaining to the location of three relics known as the dream rods. He also believes that these artifacts are hidden somewhere within, but his own research has proven fruitless.